Peter Townsend, who played in the 1969 and 1971 Ryder Cup matches, became more involved in golf course architecture when his professional playing career ended and the Winge course, laid out in the beautiful countryside of “The Hageland,” is one of his late 1980s designs. The holes at Winge Golf & Country Club are set out on hilly terrain, where fairways rise and fall with regularity across a rather undulating landscape. The first of the four par threes on the card doesn’t arrive until the 8th hole but it’s well worth the wait as this wonderful downhill hole plays to a raised green perched on a hillside, with bunkers protecting the pin on either side. The back nine finishes in great style: the short par four 17th doglegs left, plunging down to the lake shore and this hole is followed by a short par three, where the home green lies across the water, close to the 1st tee box. Steady nerves are required here to avoid a late golfing catastrophe. 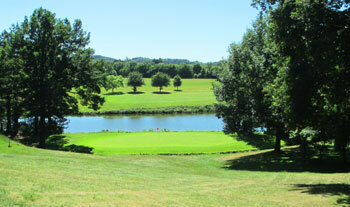 Winge Golf & Country Club is a member of the Premium Belgian Golf Courses consortium which consists of ten top 18-hole golf courses in Flanders and Wallonia. I really wasn’t prepared for just how hilly this course would be. Apart from the first hole, a par five alongside a rather lovely lake, it seemed as though every single hole played up, down or across a slope. On the 1st tee, our group of four golfers in two buggies scoffed at the recommended playing time of 4 hours and 43 minutes on the scorecard. Four hours and forty minutes later, as we putted out on the last hole, we realized that Winge played a lot longer than the 6049 metres measured for play from the back tees. A lot of this is due to the wonderful parcel of land where holes 6 to 9 have been laid out as it takes a rather lengthy drive to get to these holes and then return from them. I was a bit concerned at the start of the round because the double doglegged 3rd was more like a dog’s dinner around the putting surface as a blind, downhill approach has to be made to a green completely fringed with heavy rough. Thankfully, this avant-garde example of course architecture was never repeated, and indeed, was quickly forgotten (until now, when I checked my notes). A few holes on, I loved how the crop field to the left of the 6th hole was not fenced in. Instead, it just ran alongside the fairway; local agriculture and golf course sitting cheek by jowl. The back nine features a couple of terrific downhill doglegged par fours at holes 15 and 17, before the round ended with an heroic tee shot across the lake to the par three 18th green. If I’m honest, Winge was a lot better than I thought it was going to be after the opening three holes, even though it took a lot longer to get round than I’d expected. Buggies are definitely recommended. Anyway, as you’re probably on vacation enjoying some well-earned holiday golf, why not indulge in some resort-style golf for a wee change?